Easy weeknight dinners are key in this house. 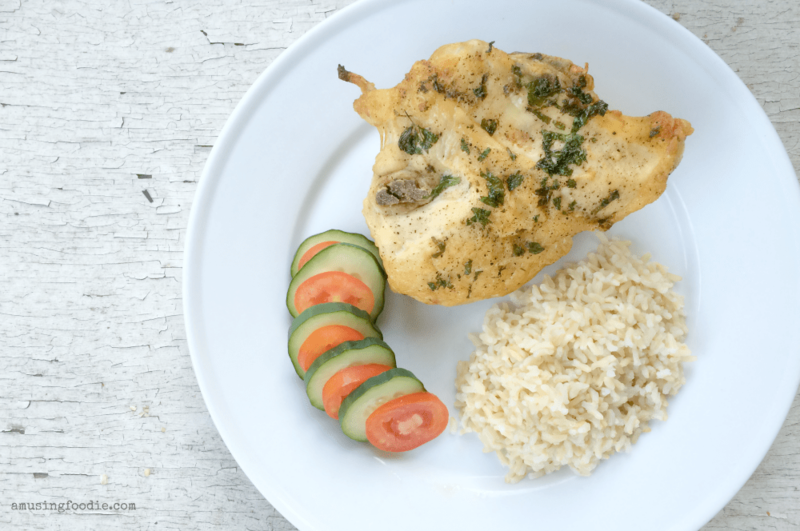 Combine a crispy oven fried chicken breast with rich, nutty brown rice, and veggies from the garden and we’re happy campers! It’s less the idea of sitting down and thinking of fun meals to make ahead of time, and more the fact that I (and really the family) have cravings some days and not others. Why play for pasta when everyone feels like tacos? But I suppose the idea that I don’t meal plan at all isn’t entirely true. I base our weekly meals on what happens to be on sale each week at the grocery store, what veggies happen to be ripe on the homestead, and what I keep in the pantry. Doing meals this way keeps me on my toes, and really gives us a way to purposefully try new things, as well as stay within a pretty tight grocery budget. I have staples that are always in the pantry, and can be used for a wide variety of things: pasta, potatoes, couscous and rice. Rice is one of my family’s favvvvvvorites, and I love it because the ways you can cook with it seem endless — it can be part of nearly any meal! While I enjoy making a quick stir-fry or a simmering jambalaya with rice, each week we have at least one meal where rice, in its basic form, is enjoyed on the side. Especially something simple to prep like Minute Whole Grain Brown Rice, ready in 10 minutes. Its rich, nutty flavor means it can hold its own along side chicken or beef. And it’s versatile enough to be played up a little, like when I’ve given it a subtle flavor with some of my homemade chicken stock in place of water … and that’s super yummy, too. 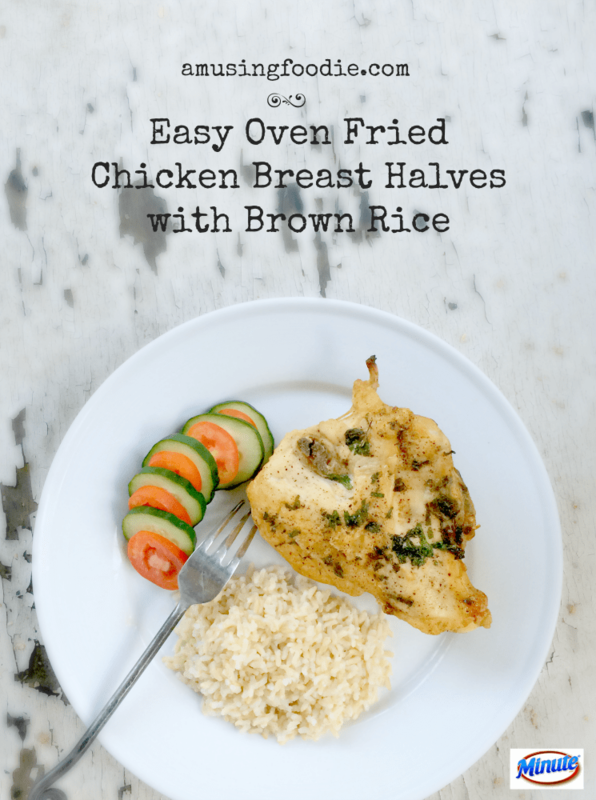 My thought was, “Why not cook oven fried chicken breast halves just like one of our favorites, Easy Oven-Fried Chicken Thighs, and save the leftovers for a casserole or a pasta dish later in the week?” Yes, I sometimes talk to myself. And so I did. Easy oven fried chicken breast halves with crispy skin…success! The beauty of this recipe (like the chicken thighs) is that it takes only a few minutes to prep, then the oven does all the work while you help the kids with homework, catch up on the latest episode of The Walking Dead, or throw in a load of laundry. 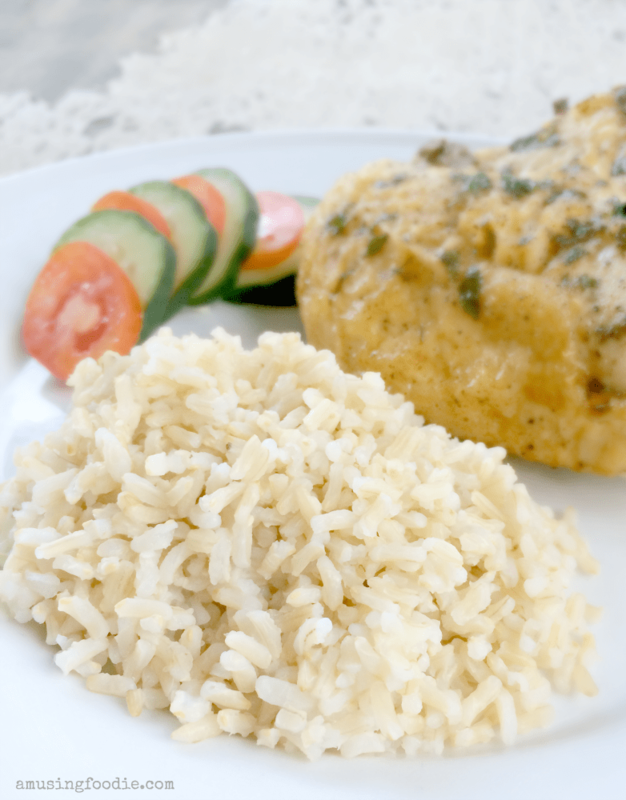 And while the chicken breasts are resting, you can make the rice — dinner’s never been more simple! Enjoy! 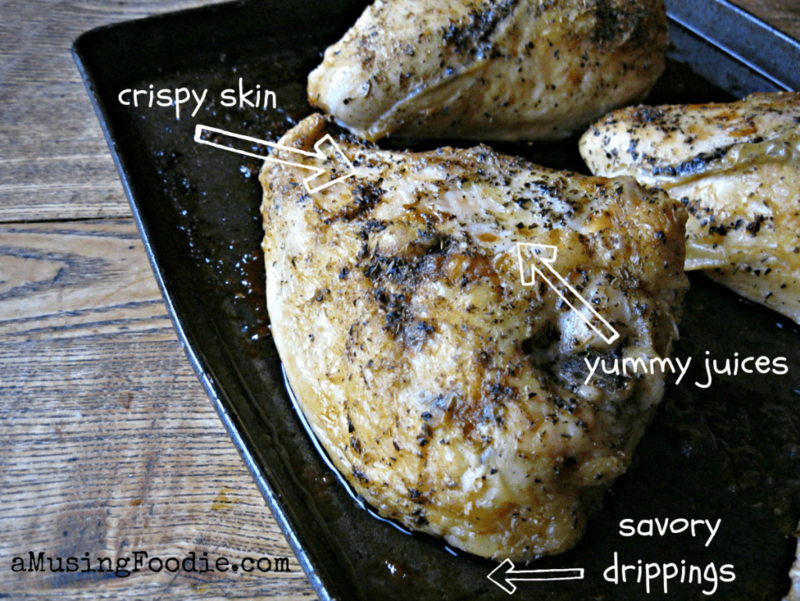 Love crispy skin? 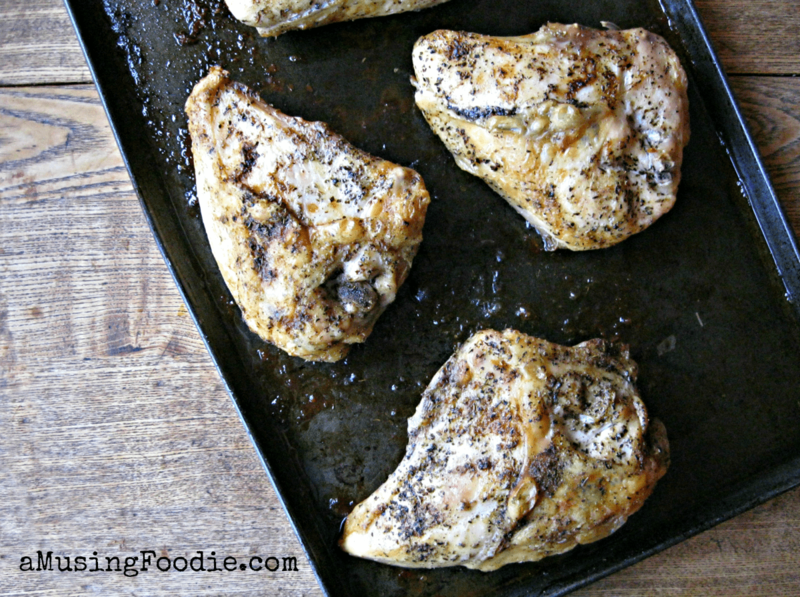 These easy oven-fried chicken breast halves fit the bill! Preheat the oven to 420°F and lightly coat the bottom of a large baking sheet with olive oil. Rinse and pat the chicken breasts dry, then place them on the baking sheet. Make sure you leave some space in between them so they don’t touch each other, or the sides of the pan. Slide 1 tablespoon of butter under the skin of each chicken breast, then coat the tops with the remaining olive oil. Sprinkle the salt, pepper, poultry seasoning, oregano and basil evenly over each chicken breast. Place the chicken in the oven and let it bake for about 60 minutes, or until the skin is golden and crispy, and the juices run clear. Internal temperature at the thickest part of the chicken should read about 170°F. Remove the chicken breasts from the oven and let them rest for 10 minutes. The temperature will rise another 5-10° while they sit. Delicious and easy. Thank you. We are snowed in here in CT following Jonas and my husband had no desire to fire up the Weber so I used this recipe with slight riff because I didn’t have poultry seasoning (used turmeric, cumin, sage and a bit of garlic). Anyhoo, turned out great, crispy but juicy. Thank you!